In February, 2009, I wrote about the supposed lost decade talk which was making the rounds at that time and pointed out that stocks were comparatively cheap versus Treasury Bills and due for a major rebound. Since then, stocks have rebounded sharply and posted the best rebound from a bear market since the 1930s. 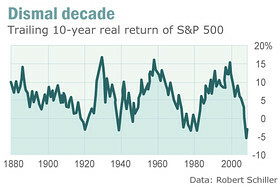 History has shown that bad decades are followed by good ones - see chart below. Know the importance of being diversified and examining properly diversified stock and bond indexes.